Home > I o T > Standardising IoT Connectivity by the Kilometer: SIGFOX, LoRa, or LTE? As everyone is probably tired of hearing, the Internet of Things is supposed to connect everyone with everything connectable, everywhere. So far, there's been little tangible evidence of this, as it's being driven initially not by consumers but by industrial, government and other applications that are more difficult to spot. But make no mistake: IoT is emerging, just not in the way everyone has been told to expect. Evidence of this can be seen in developments simultaneously taking place that pit wireless carriers against startup companies to connect all of the tiny, sensor-enabled devices at the core of IoT. • EC-GSM (Extended Coverage), which allows existing GSM cellular networks to be used for IoT applications through the addition of software. • The fifth generation of wireless, 5G, coming sometime after 2020. So the race is on. The wireless carriers have an enormous advantage in that they already have coverage virtually everywhere but if the LPWAN providers rapidly get their solutions in place it's reasonable to assume that the potentially enormous revenue to be gleaned from IoT connectivity will wind up being shared between the wireless carriers and LPWAN providers. Wireless carriers are already providing connectivity using their legacy second-generation (2G) technology that they've been required to maintain. However, most wireless carriers will turn off their 2G networks by December 31 of this year, a process typically called the '2G sunset', so alarms and other systems relying on them will have to upgrade to 3G or 4G by that time. This is why the Third Generation Partnership Project (3GPP) that manages wireless standards has included substantial specifications dedicated to IoT in its latest standard called Release 13, which was finalised in June. IoT connectivity will be continually addressed in revisions to the standards until those for 5G are finalised, scheduled to happen in 2019. By that time, wireless carriers will have a solid roadmap for IoT connectivity for the ensuing years. IoT connectivity can basically be separated into three categories: short, medium, and long range. Short Range: Bluetooth, WiFi, and Zigbee are short-range solutions that were never designed to cover large areas. Their ranges are measured in meters, not kilometers. Mid-Range: The middle ground is occupied by wireless carriers and LPWANs that are designed to have significant range along with low service costs, carrier-grade security and encryption, and other features tailored to specific applications. The cost of these solutions to the services that use them is currently high if delivered by wireless carriers, but it is difficult to believe that carriers will not ultimately make their services more cost-effective considering the competition from LPWAN. Long Range: Direct communication with satellites is a 'longest range' solution, but is very expensive. Range extends to Mars and beyond, but there are latency issues with increasing distance and power consumption is high. For the remainder of this article, we will discuss only a handful of the many mid-range solutions for IoT connectivity. Mid-range IoT can be serviced by at least two technologies: wireless networks via cellular carriers, or by a growing segment of technologies that fit in the Low-Power Wide Area Network (LPWAN) category. LPWANs can be differentiated to a large degree by the modulation schemes they employ, which are ultra-narrowband, narrowband, and wideband. Ultra-narrowband networks trade on the fact that as transmit bandwidth shrinks the noise floor rises, which positively impacts receiver sensitivity, range, and the need for lower transmitted power. These characteristics also define what ultra-narrowband systems can achieve, specifically only low data rates and small data packet sizes, along with unidirectional or bidirectional communications. Narrowband networks can provide a satisfactory compromise between their narrower and wider counterparts, providing considerable range and capacity. Finally, wideband networks, with channels sizes of 500kHz to greater than 1MHz have the highest data rates. The summary above is an extremely simplified explanation of what in reality are very complex systems. For example, the capabilities of each type of network can be improved by using techniques such as spread spectrum modulation as well as other often proprietary approaches. Consequently, the performance of ultra-narrowband, narrowband, and wideband networks varies greatly with each vendor. For potential customers, the choice between all of them is complicated by other factors such as network capacity, quality of service, reliability, and security that must also be considered before choosing a specific solution. In addition to IoT connectivity provided by wireless carriers (LTE/4G/5G), there are a variety of competitors, and the largest six are covered below: LoRa, Symphony Link (and Ensemble), SIGFOX, Weightless, Nwave, and Ingenu. All have developed solutions that make them different from each other in many ways based on the use of proprietary software, networking techniques, and other factors. LoRa (an acronym of Long Range) is the physical layer of a set of open standards for bidirectional devices championed by the LoRa Alliance. Its network implementation is called LoRaWAN and was developed by Semtech (which owns the core chip technology), along with IBM Research, and Actility. LoRa uses chirp spread spectrum modulation, and a base station can typically cover hundreds of square kilometers, depending on environmental factors. Semtech's SX1276 low power long range tfansceiver is used in automated meter reading, home and building automation, wireless alarm and security systems, industrial monitoring and control, and long range irrigation systems. 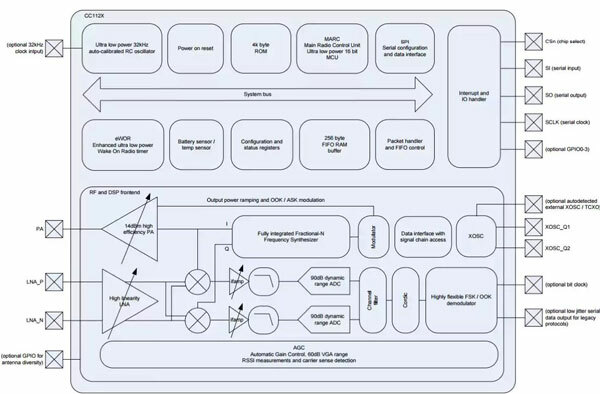 Figure 1: The Semtech SX1276 Low Power Long Range Transceiver functional block diagram. Image: Semtech. The technology allows communication to be conducted over multiple channels at varying data rates, depending on range and required message duration. Data rates range from 300b/s to 50kb/s, managed by the network server along with the RF output power of each user IoT device. The approach provides security at the network, application, and device levels and can accommodate all classes of bidirectional IoT devices. This technology, developed by Link Labs, is a proprietary variant of LoRa WAN that uses its physical layer but a different MAC architecture to provide additional functionality. The company's premier product called Symphony Link system uses an eight-channel base station operating in the 433MHz or 915MHz ISM bands as well as the 868MHz band used in Europe. It can transmit over a range of at least 10m and backhauls data using either WiFi, a cellular network, or Ethernet using a cloud server to handle message routing, provisioning, and network management. SIGFOX is the product of a French company by the same name that has currently deployed networks in 19 countries, covering 1.2 million km² including San Francisco in the U.S., giving it the distinction of being the current leader of the pack. The company announced in May that it intends to expand its coverage in the U.S. to cover 100 cities. SIGFOX operates at 868 or 915MHz and transmits very small amounts of data very slowly (300b/s) using Binary Phase Shift Keying (BPSK). SIGFOX can achieve long range coverage and has general characteristics that make it well suited for any IoT application requiring only small amounts of data. A SIGFOX network uses ultra-narrowband modulation that allows messages to travel up to 1000km with a single base station, with capacity of up to 1 million IoT devices per base station. Data payload is only 12 bytes per message and up to 140 messages per day per device, which is adequate for a substantial number of applications. Initial networks were unidirectional but bidirectional capability may soon be available. 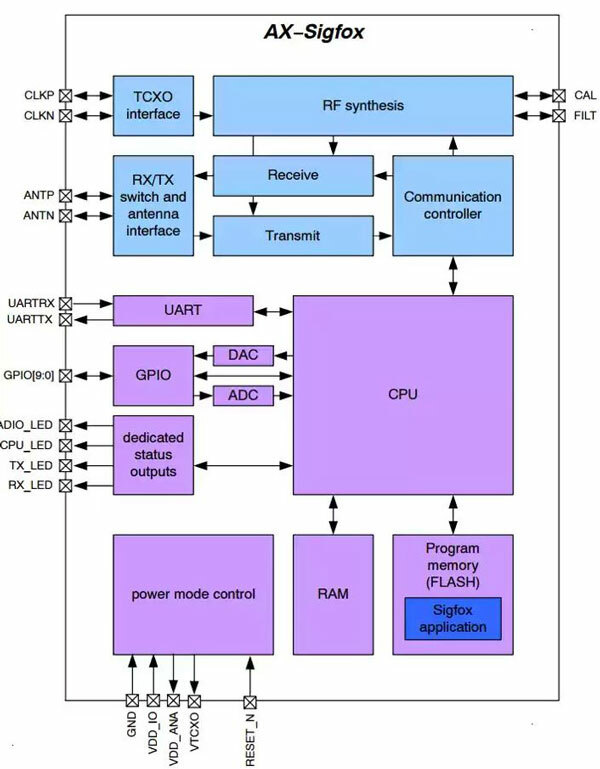 Figure 2: Functional block diagram of ON Semi's AX−SigFox transceiver IC (P/N: AX-SFEU-1-01TB05 ), which connects to the customer product using a logic level RS232 UART. AT commands are used to send frames and configure radio parameters. Image: ON Semi. This open standard has three versions: Weightless-N, Weightless-P, and Weightless-W. Weightless-N is unidirectional, provides range of more than 5km, and is the most basic variant. Weightless-N-enabled IoT devices can operate for ten years before battery replacement. Weightless-P is a bidirectional version with a more complete feature set and a range of 2km or more, whose enabled devices can last between 3 and 8 years. Finally, Weightless-W is the most extensive bidirectional implementation and offers a range of more than 5km, and enabled devices can operate between 3 and 5 years. Weightless-W operates in the TV white space spectrum. The Weightless network uses GMSK and offset-QPSK spread spectrum modulation schemes and 12.5kHz-wide channels, and has a transmitted RF power of only 17dBm. When enabled in an IoT device, quiescent current consumption is only 100µW making it compatible with the many IoT sensors that get their power from a lithium-ion watch battery. Weightless can be used in any license-free band. 128/256 AES encryption and authentication are available for both the terminal in the network. In June, the Weightless Special Interest Group joined the European Telecommunications Standards Institute (ETSI) in an effort to consolidate solutions using ultra narrowband technology. Nwave uses ultra-narrowband technology and Software-Defined Radio (SDR) techniques and can operate in any unlicensed frequency band. The base station can accommodate up to 1 million IoT devices over a range of 10km with RF output power of 100mW or less and a data rate of 100b/s. Battery-operated devices can operate for up to ten years. Ingenu's Machine Network operates in the 2.4GHz band and bases its capabilities on a modulation scheme called Random Phase Multiple Access (RPMA) that uses direct-sequence spread spectrum and tight control over transmit power along with high receiver sensitivity to provide a high link budget. RPMA 'self modulates' to find and interference-free transmission path between the network and device. The company claims it can cover 300m per base station under typical conditions. It is currently being used in the Dallas/Fort Worth area to cover about 2,116m². serving more than 4.4 million people using only 17 access points. The technology has been deployed at more than 38 locations. For many of these solutions, silicon vendors have already developed product lines that continue to grow rapidly. For example, Silicon Labs' Si4464 transceiver covers a frequency range of 119 to 1050MHz and has very low active power consumption. Texas Instruments' CC1120 transceiver is designed for use in narrowband networks with channel spacing as low as 12.5kHz. The company strongly supports the narrowband approach for which its rationale is defined nicely in a white paper on this topic. Atmel's ATA8520 single-chip transmitter for SIGFOX operates at 868MHz and consumes less than 33mA at an output power of +14.5dBm. The ON Semiconductor AX-SIGFOX low-power transceiver also operates at 868MHz and includes transmit and receive firmware. All four companies have other products for IoT connectivity as well as design support. Figure 3: System block diagram of Texas Instruments CC1120 high-performance, RF transceiver for Narrowband Systems. Image: TI CC1120 Datasheet. The elephant in the room is LTE delivered by wireless carriers. As IoT has been in the works for years, the 3GPP has been working to accommodate it in the standards development process. LTE-M was rolled out in 3GPP Release 12 and Release 13 adds many specifications focused exclusively on serving IoT. It includes narrow 200kHz bandwidth capability and also 'wider' bandwidth capability of 1.4MHz bandwidth, the latter still being much narrower than standard LTE. All duplex modes are designed to minimise latency, transmit power for enabled devices is a modest 20dBm, and other provisions should allow them to operate for up to five years on two AA batteries. It also presumes that the cost of LTE modems will need to decline by up to 50%. There is considerable speculation about whether wireless carriers will ultimately reign over all of IoT connectivity. Those who believe that it will, note that the physical infrastructure is already in place, so only relatively minor modifications will be required, and that the wireless industry has huge resources that it will surely devote to ensure it gains most of the market, at the least. As this story goes, it's possible that the wireless industry could wipe out all its competitors in one fell swoop. That said, while AT&T recently announced that it will use an 'all-LTE' approach to providing IoT connectivity, it will not rule out using one or more of the LPWANs if it makes sense in a specific situation. At the other end of the spectrum are those who believe that wireless carriers will take advantage of the potentially higher performance they can provide to serve the most demanding, high data rate cloud-based applications that require connection of IoT devices over huge geographical areas, thus justifying higher service costs. A typical application might be a manufacturer of industrial machines enabled with IoT sensors that are installed throughout the world. The remainder of the market would be served by LPWAN providers. Regardless of how this marketplace eventually matures, there is now no doubt that IoT will be far more visible to greater numbers of people in the next few years.